Natures Aid Saw Palmetto Complex has been formulated to help support a healthy prostate. 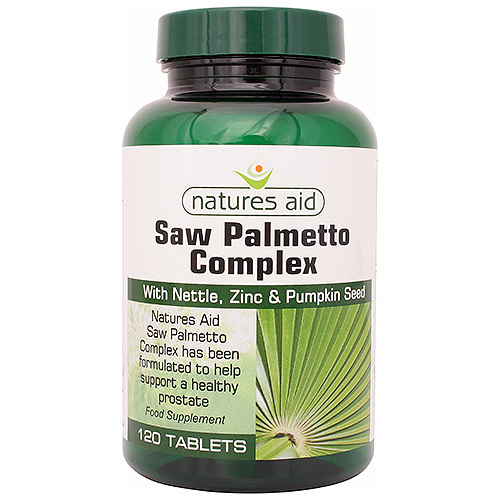 Natures Aid Saw Palmetto Complex provides 160mg of Saw Palmetto Berry Extract. 160mg of Saw Palmetto Extract is equivalent to approximately 1600mg of dried berries and is standardised to provide 72mg of fatty acids. 50mg of Nettle Leaf extract is equivalent to approximately 500mg of dried leaf. Microcrystalline Cellulose, Di-Calcium Phosphate, Saw Palmetto Prep (Saw Palmetto Extract, Tri-Calcium Phosphate, Silicon Dioxide), Nettle Leaf Prep (Nettle Leaf Extract, Maltodextrin), Anticaking Agent (Vegetable Source Stearic Acid), Zinc Picolinate, Sodium Carboxymethylcellulose, Anticaking Agent (Silicon Dioxide), L-Glutamic Acid, Glycine, Anticaking Agent (Vegetable Source Magnesium Stearate), L-Alanine, Copper Gluconate, Pumpkin Seed Prep (Pumpkin Seed Extract, Tri-Calcium Phosphate, Maltodextrin). Below are reviews of Natures Aid Saw Palmetto Complex - 120 Tablets by bodykind customers. If you have tried this product we'd love to hear what you think so please leave a review.